Our Trust aims to be at the forefront when it comes to giving young people and adult learners a helping hand on the road to a career in the NHS. The ’Get In’ Work Experience Programme is in line in with the NHS Health Education England Talent for Care Widening Participation Programme - ‘Get in, Get on and Go Further’. Due to capacity within all departments, placements are limited and we prioritise local students who either live or attend an educational institute in the London boroughs of Barking and Dagenham, Havering and Redbridge. Please check this page regularly for updates on our upcoming Medical and Nursing career programmes. Our next workshop will take place at King George Hospital from Tuesday 28 May 2019 to Thursday 30 May 2019. Applications are open to year 12 students in the catchment area of Barking, Dagenham, Havering or Redbridge. Closing date for receipt of applications is Tuesday 30 April 2019 at 5pm. Please note all applications will be considered after the closing date. Unfortunately we cannot consider applications from outside our local boroughs or any received after the deadline. Please note we will only be taking applications via the link provided. With North East London Foundation NHS Trust, we are offering a four day Step into the NHS work experience workshop. Step into the NHS is only for people who want to become nurses, allied health professionals or have a career in non-clinical professional services such as finance or organisational development. raise awareness of the career paths available to you. The workshop is for over 16s only. The next workshop will be from Monday 8 April to Thursday 11 April 2019 at Queen's Hospital, with the potential of placements being at King George Hospital, so you may be required to travel between sites. 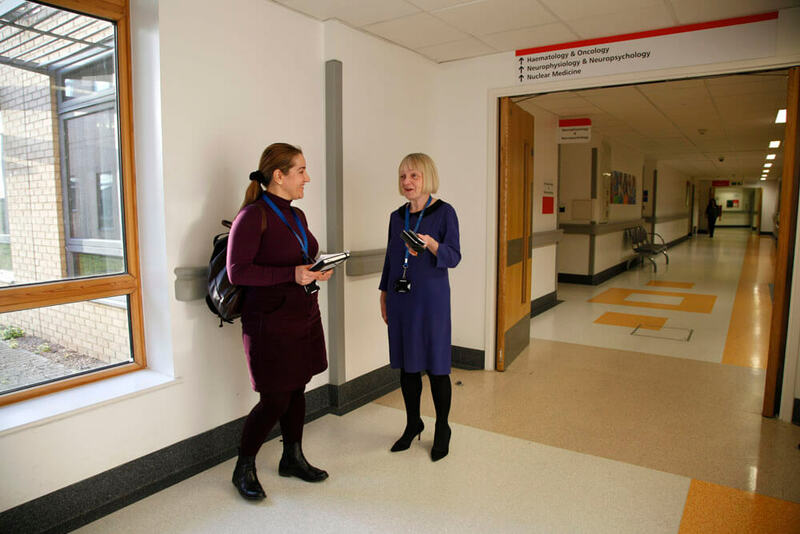 The aim of the programme is to give you an insight into the diverse range of work carried out by different healthcare professionals in two large Trusts, allowing you to make an informed decision about pursuing a career in the NHS. The expression of interest deadline is Friday 8 February at 5pm, anything submitted after this date will not be considered. If you meet the criteria for this workshop you will be contacted Monday 11 February for the second stage of the application process. Unfortunately, if you do not hear back by that date, your application has not been successful. The second stage involves completing a full application form, which includes references. Applications must be fully completed and returned by 5pm on Friday 22 February. Applications will be shortlisted and if you are successful you will be contacted the week commencing Monday 25 February. If you would like to be considered for this workshop opportunity please complete the expression of interest form below stating Step into the NHS. Any applications that are submitted for medical work experience will not be considered. This is a day-long course aimed at AS/A Level students who are planning to apply for medicine. The course is led by practising doctors who have graduated from different universities. The course will take place on Saturday 22 September 2018. It will be held in the James Fawcett Education Centre at King George hospital. Clinical skills sessions- be taught how to take blood like you will be in medical school. The course has a cost of £200 per person. Candidates will be chosen on a first come first served basis. Unsuccessful candidates will be contacted when the next course has been arranged this autumn. School students (year 12 to year 13) who are seeking a work experience placement within context of their school’s career activities. We support local schools by providing placements for school students. Unfortunately, we do not have the capacity to support applications from schools outside our local boroughs. Please note: We only offer a structured work experience programme for medical and nursing placements. Medical work experience programmes are only available to students in Year 12 and above. Please do not submit an expression of interest for any medical related (Doctor/Surgeon/Consultant shadowing) or general nursing placements as we are unable to process these requests. People and young people must not directly contact relatives, friends or employees within our Trust requesting placements or send generic letters to wards/departments or individuals who already work within our hospitals. Any requests need to be submitted by completing the below ‘expression of interest’ form. Unfortunately we are unable to accommodate any work experience requests for students that are under the age of 16, this is due to the nature of the work carried out in the hospital. Please note our numbers are restricted and therefore not every applicant can be accepted. Students are advised to consider carefully what their area of interest is and formulate their personal statement of application accordingly. The length of placement will depend on area of work experience. We will not be able to consider applications where you do not fit the criteria or do not follow the correct procedure for expressing an interest. Please do not submit an expression of interest if you are under the age of 16 as we will be unable to consider your application. If you meet the essential criteria, please submit an Expression of Interest by completing the form below. Please ensure you include all the information required. If you do not meet the criteria or do not send all the necessary information we will not be able to process your request. If your expression of interest meets all criteria you will be sent the relevant application forms for you to complete. If you do not receive a response within three months of your initial request, you should assume that there is no availability at this time. *Spam Guard: Is water wet or dry? We help lots of people each year, but we can’t do it without our army of volunteers and our amazing fundraisers, all set to Bedrock Radio soundtrack.